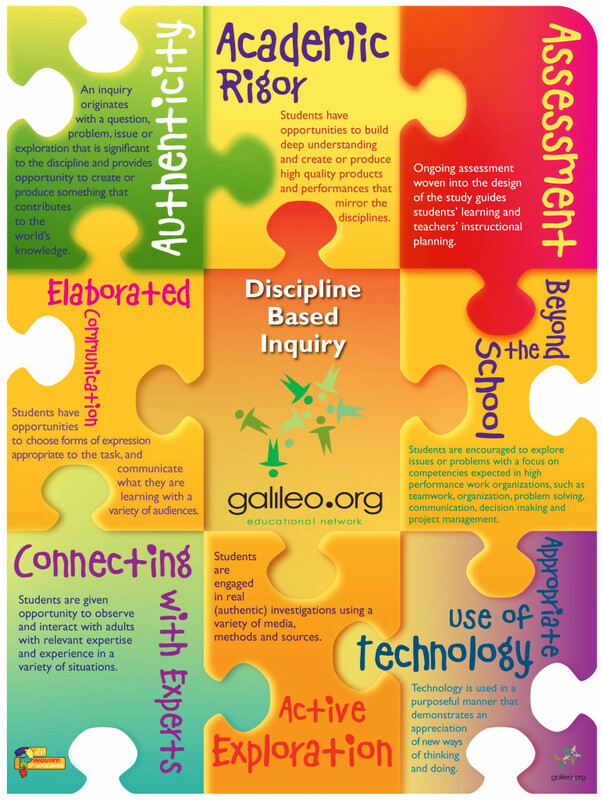 The inquiry emanates from a question, problem or exploration that has meaning to students. The inquiry is recognizable to an adult at work or in the community as they might actually tackle the question, problem, issue or exploration posed by the inquiry. The inquiry originates with an issue, problem, question, exploration or topic that provides opportunities to create or produce something that contributes to the world’s knowledge. The inquiry requires a variety of roles or perspectives. Students build knowledge that leads to deep understanding. Students are provided with multiple, flexible ways to approach the problem, issue or question using methods of inquiry central to the disciplines that underpin the problem, issue or question. Students develop habits of mind that encourage them to ask questions of evidence, and determine viewpoints, patterns and connections. Assessment guides student learning and teachers’ instructional planning. 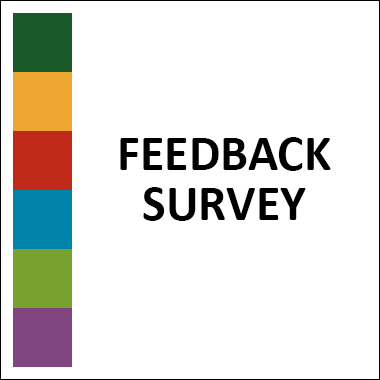 On-going assessment is woven into the design of the inquiry study, providing timely descriptive feedback. Assessment takes place both in groups and in self-evaluation. Assessment requires students to reflect on their learning using clear criteria they help set. Students use these reflections to set learning goals, establish next steps and develop effective learning strategies. Assessment requires the involvement of teachers, peers, adults from outside the classroom and students. The inquiry requires students to address a semi-structured question, issue or problem, relevant to curriculum outcomes, but grounded in the life and work beyond the school. 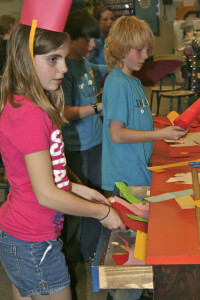 The inquiry assists students to become self-regulated. They develop organizational and self-management skills in order to complete the study. The inquiry leads students to acquire and use competencies expected in high performance work organizations (eg. team work, problem solving, communications, decision making and project management). 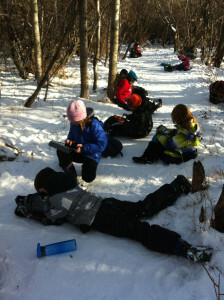 Students use technology in a purposeful manner that demonstrates new ways of thinking and doing. Technology is essential in accomplishing the task. 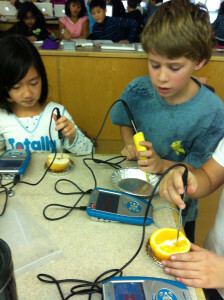 Students are required to determine which technologies are most appropriate to the task. Students conduct research, share information, make decisions, solve problems, create meaning and communicate with various audiences inside and outside the classroom. Students and parents have on-going, online access to the study as it develops. 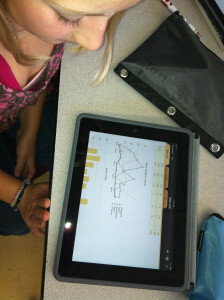 Students make use of sophisticated applications and technologies for learning. Students spend significant amounts of time doing field and design work, labs, interviews, studio work, and construction. Students must engage in real, authentic investigations using a variety of media, methods and sources. Students communicate what they are learning with a variety of audiences through presentation, exhibition, website, wiki, and blogs. Students observe and interact with adults who have relevant expertise and experience in the field of study. Students, teachers and outside experts collaborate with one another on the design and assessment of the inquiry work. Students have extended opportunities to support, challenge, and respond to each other’s ideas as they come to understand relevant concepts. Students have opportunities to negotiate the flow of conversation within small and large group discussions. Students have opportunities to choose forms of expression to express their understanding. Students communicate what they are learning with a variety of audiences .